The incident occurred in August of last year, but it was only earlier this week, on Wednesday, that police bodycam footage was obtained by the Citizen Times showing the brutal beating of Johnnie Jermaine Rush at the hands of Asheville, N.C., Police Officer Chris Hickman. In the video, Hickman can be seen punching Rush multiple times in the head and even taunting him as Rush is restrained by Hickman and another officer. As the Times notes, back in January, police launched a criminal investigation into whether Hickman used excessive force in the arrest of Rush, who was suspected of jaywalking and trespassing after he walked across the parking lot of a business that was closed for the day. Hickman then resigned sometime before Jan. 19. 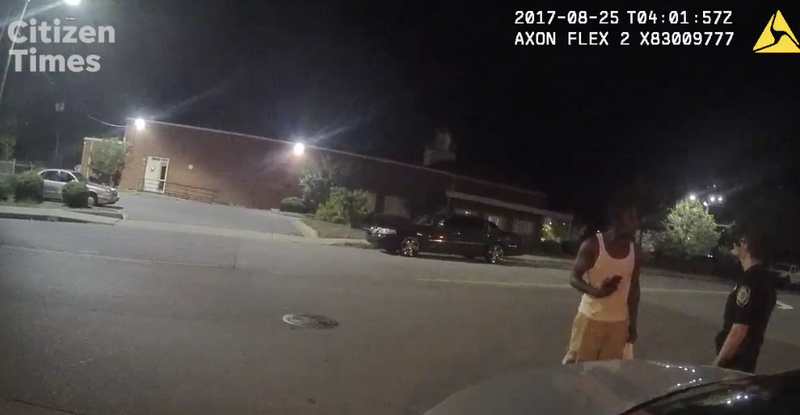 In the bodycam footage, Hickman and then-officer-in-training Verino Ruggiero were seen in the police cruiser, only for one of the officers to start complaining about Rush’s jaywalking after he had been warned. Rush was walking past a street corner that had very little traffic at that time of night, and one that is always used by pedestrians—without the use of a crosswalk—particularly before and after baseball games, as the corner is near McCormick Field. Nonetheless, officers stopped him again to confront him about his repeated jaywalking. Rush tried to explain to officers that he was tired, having just finished working a 13-hour shift at Cracker Barrel, but the officers weren’t having it. Rush was initially confronted by Ruggiero, who in the video points out that he had warned Rush before. Apparently, Ruggiero takes that as some kind of challenge to his authority. “All I’m trying to do is go home, man. I’m tired. I just got off work,” Rush responds. “You just committed four crimes in a row,” Ruggiero can be heard saying. “I was polite with you and asked you [to] use the crosswalk. I know what you’re doing man, you think I’m a punk. Guess what? I’m not. “I’ve got two options: I can either arrest you or write you a ticket,” Ruggiero adds. Rush then swears in what appears to be exasperation, apparently prompting Hickman to arrest him. Hickman tells him to put his hands behind his back. Rush then takes off running. “You know what’s funny is you’re going to get fucked up hard-core,” Hickman then yells at Rush as he points his Taser at him. Rush told the Citizen Times that he stopped, but in the video, Hickman and at least one other officer are seen pushing him to the ground, where Hickman starts punching him repeatedly in the head. “Put your hands behind your back, put your hands behind your back,” Hickman says, even as he strikes Rush. During the beating, Rush can be heard yelling, “I can’t breathe,” and is also heard screaming for help. Rush was shocked with a Taser multiple times throughout the arrest. Rush appears to have said something that could not be heard on camera, because then Hickman starts to taunt him. “Do anything stupid and you’re going to get hurt further,” Hickman adds as he takes Rush to the police vehicle. “You didn’t have to punch me in my face for no reason,” Rush tells him. As Rush recounts the incident to other officers on the scene, he claims that Rush tried to grab his Taser. Meanwhile, Rush told the newspaper that he was taken to the hospital after the encounter, and that while there, Hickman continued to be abusive and even used a racial slur. Rush was charged with assault on a government official; resisting, delaying and obstructing an officer; and trespass and traffic offenses, but those charges were all thrown out by the Buncombe County District Attorney’s Office back in September. Police Chief Tammy Hooper said that after reviewing the video, both she and District Attorney Todd Williams asked the state Bureau of Investigation to start a criminal investigation, but the bureau declined. Williams then requested that another agency take up the case. “When that was turned down, I felt that a criminal investigation was still required,” he said Wednesday. Meanwhile, Asheville Mayor Esther Manheimer said that she and the City Council are outraged by Rush’s beating, especially since the council apparently only recently learned of the incident, which occurred last year. The mayor also issued a statement apologizing to Rush on behalf of the City Council. The City Council and I immediately contacted city administration to express our outrage at the treatment of Mr. Rush and our outrage of not being informed about the actions of APD officers. The Council is calling for a review of the violent acts against a city resident and what swift and immediate action was taken by APD upon review of the video footage. We will have accountability and, above all, transparency. As your mayor, I want there to be a clear message that there must be an end to police abuse of power. I support APD Chief Hooper in her efforts to emphasize de-escalation. The acts of these officers do not represent the professional and fair treatment a vast majority of our officers show in the course of their duties day in and day out.